Brian was born in Babbacombe, Torquay and his parents were Edna and Frank Beale. Frank was a musician, playing in hotel orchestras and dance bands. The family moved to Exeter in 1939, where Frank played trumpet with Norman Pincott’s Orchestra at Dellers Café. Brian recalled the city centre as a fascinating warren of back alleys and courtyards. 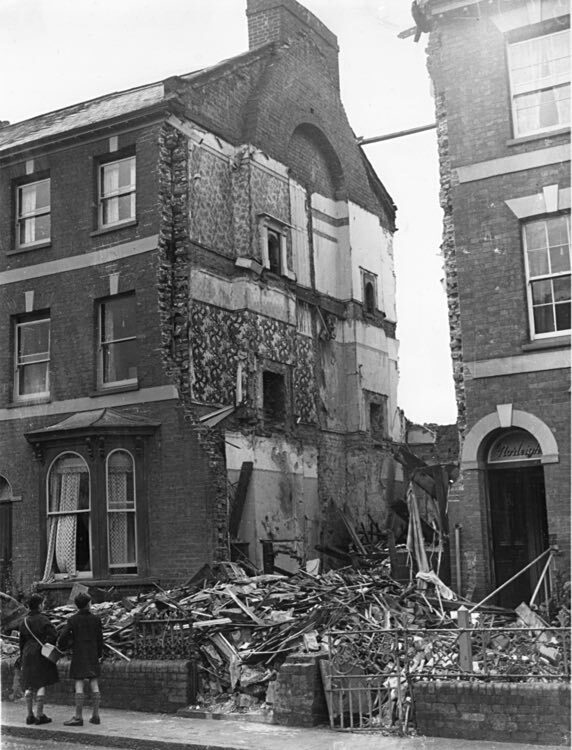 On 17 September 1940, returning to Blackboy Road from seeing “Jamaica Inn” at the cinema, they found the house next door destroyed by a bomb, with four children dead, and their own lodgings on the point of collapse. Frank was briefly allowed in to retrieve a few items of clothing but with no help forthcoming from the authorities, they were taken in by friends, Mina and Jack Harris, in Old Tiverton Road. Leaving Ladysmith Senior School at 14, Brian joined up as an ARP bike messenger and he recalled that their club in Friernhay Street sold the boys lemonade for threepence. On the night of the May 1942 Blitz, he was woken by intense light and a crackling sound which came from the magnesium parachute flares dropped to guide the raiders. All through the bombing, he carried messages between the Heavy Rescue Squad’s depot by Polsloe Bridge and the ARP’s control centre, a lean-to beside the City Library. It was Brian who told the centre's personnel the Library was on fire — they hadn’t realised. The reaction of the two men on duty was to swear loudly and get out in haste, leaving him there. He cycled back down Castle Street with the flames from the burning buildings making an arch above his head. The road surfaces were so hot that his tyres melted—and afterwards the ARP wouldn’t pay for new ones. With Deller’s destroyed, Frank and Edna were drafted into war work, for which they were sent on a training course in Bristol before returning to Exeter to rewire damaged Spitfires. Edna used to go walking in the country at weekends, seeing what she could buy from farmers to supplement the family’s rations. A junior clerical job with the Air Ministry gave Brian a pass to Exeter Airport. He used it to spend every weekend there and was taken on joyrides by Flight Lieutenant Alexandrowicz and other pilots of 307 Polish Squadron. He saw Typhoons take off to raid targets in occupied France and American Flying Fortresses make emergency landings with wounded aboard, the survivors defying their officers and heading for the nearest pub. He also remembered that the RAF airmen used to drink in the Rougemont Hotel. He fired the guns of a Beaufighter, and was up in an Airspeed Oxford when warning was given of a German “tip and run” raid, visible as small specks in the distance — the pilot landed as fast as the old training plane would go. Dad remembered the war as an exciting time, with something new always happening — one example he gave was riding his bike out in the country and seeing aircraft hidden under trees on the edge of a field. He was caught out trying to join the Army underage, having altered his birth certificate using the juice from an onion. He was finally called up early in 1945, at the age of 17 and became an instructor in the Physical Training Corps. The bombed house in Blackboy Road.